Ford Madox Ford (1873–1939) is a major figure in twentieth-century literature and culture. The author of over eighty books and the editor of two groundbreaking periodicals, the English Review (1908–10) and the transatlantic review (1924), he is best known as the writer of two exemplary modernist works: The Good Soldier (1915) and Parade’s End (1924–8). 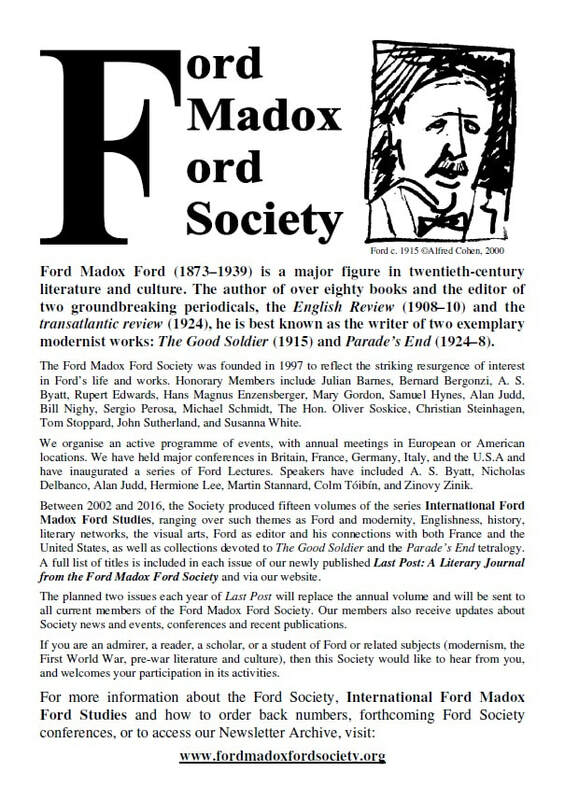 The Ford Madox Ford Society was founded in 1997 to reflect the striking resurgence of interest in Ford’s life and works. Honorary Members include Julian Barnes, A. S. Byatt, Rupert Edwards, Hans Magnus Enzensberger, Mary Gordon, Samuel Hynes, Alan Judd, Bill Nighy, Sergio Perosa, Michael Schmidt, The Hon. Oliver Soskice, Christian Steinhagen, Tom Stoppard, John Sutherland, and Susanna White. We organise an active programme of events, with annual meetings in European or American locations. We have held major conferences in Britain, France, Germany, Italy, and the U.S.A and have inaugurated a series of Ford Lectures. Speakers have included A. S. Byatt, Nicholas Delbanco, Alan Judd, Hermione Lee, Martin Stannard, Colm Tóibín, and Zinovy Zinik. Between 2002 and 2016, the Society produced fifteen volumes of the series International Ford Madox Ford Studies, ranging over such themes as Ford and modernity, Englishness, history, literary networks, the visual arts, Ford as editor and his connections with both France and the United States, as well as collections devoted to The Good Soldier and the Parade’s End tetralogy. A full list of titles is included in each issue of our newly published Last Post: A Literary Journal from the Ford Madox Ford Society and via our website. The planned two issues each year of Last Post will replace the annual volume and will be sent to all current members of the Ford Madox Ford Society. Our members also receive updates about Society news and events, conferences and recent publications. If you are an admirer, a reader, a scholar, or a student of Ford or related subjects (modernism, the First World War, pre-war literature and culture), then this Society would like to hear from you, and welcomes your participation in its activities. Click here to find out more about how and why to join the Ford Society. You can also contact the executive committee, read more about Ford's life, see a full list of his books and consult our comprehensive bibliography of critical writing on Ford.